The film Megan Leavey carries a message much more important than its pedestrian name and movie trailers imply. This is not a feel good war film, nor one principally of battlefield heroism. Instead it’s a poignant and relatable story about human trauma and healing based on the real life experiences of coincidental war hero and her role as the handler with her bomb-sniffing dog. 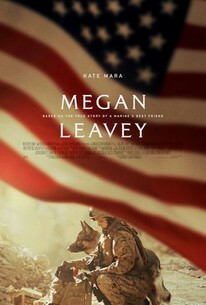 Megan Leavey doesn’t break artistic ground. Instead, the film relies on stand-out performances by the cast and director Gabriela Cowperthwaite’s yoeman’s approach to putting together a first-rate movie. As a result, critics may have underestimated the emotional power of the film, particularly for movie goers that have experienced emotional trauma through violence and know someone who has. The biopic follows Leavey (Kate Mara, House of Cards, The Martian, The Fantastic Four) as she joins the Marines to escape a dysfunctional family life and the tragic death of her best friend. She hasn’t quite sowed her wild oats, however, and is punished by cleaning the cages for her unit’s bomb-sniffing dogs. As she observes the handlers and training, Leavey connects with the dogs and their mission. She begins to see herself as a handler, and this invigorates a sense of purpose. Under the relentless pressure of her master sergeant (rap artist Common, American Gangster, Terminator Salvation, John Wick: Chapter 2), Leavey develops discipline and focus. Marine Corps hazing is shown for what it is—both a test of discipline and a mechanism for “toughening” soldiers up. This training and discipline ultimately allows Leavey to grapple with the challenge of being assigned an unruly German Shephard named Rex and perform on the battlefield. When Leavey and Rex are targeted by insurgents in Iraq and seriously injured by a roadside bomb, they stay focused on their mission and push their squad (in the film at least) to root out the insurgents despite their wounds. This earns Leavey a purple heart, the respect of her peers, and the moniker of “war hero,” and the audience immediately feels the injustice of not bestowing similar recognition on Rex. (The real-life Megan Leavey earned a purple heart and the Navy and Marine Corps Achievement Medal for heroism in combat). Leavey is evacuated to Baghdad, and then sent to the U.S. for rehabilitation. Rex, meanwhile, is left at the base in hostile territory. This is where the film becomes less a heroic tale of resolve and maturation and more of a compelling story of emotional trauma, the human toll of violence, and a pathway to healing through emotional connection. After being “exploded,” Leavey suffers from PTSD. She unsuccessfully attempts to gut through the healing. She becomes fixated, even obsessed, on saving Rex from future deployments. At first, her emotional attachment to the dog seems like deflection from her own emotional brokenness. As the story unfolds, the full depth of the emotional attachment between the two partners becomes clear. Rex is as much a victim of the war as she is, and her efforts are really focused on trying to save his life—from the battlefield as well as the Marines Corps bureaucracy which assumes the dog cannot be retrained for civilian life. The director wisely does not turn the film into a conventional feel good story, where Rex heals the broken relationships in Leavy’s life. Nor does Copwerthwaite fall into the trap of giving the dog humanlike qualities. Leavey saves Rex’s life, but her personal life remains chaotic, and her family dynamics dysfunctional. She has not matured enough by the end of the movie to fully embrace her mother’s (Eddie Falco, The Sapranos, Oz) sincere if misguided attempts to help her. Even her biological father (Bradley Whitford, Get Out, Saving Mr. Banks, The West Wing) struggles to talk to her on a personal and intimate level although he comes through at a pivotal plot point. In the end, Megan Leavey is not a feel good movie of how a dog heals the emotional brokenness of those he touches. The story is about human brokenness, how violence ruptures fundamental relationships, and the importance of ensuring those relationships are honored and given the attention they deserve. Rex is “saved” by the strong emotional bond between him and his handler, not because Leavey is a compassionate human being who just doesn’t like to see animals hurt. Dog owners will appreciate the degree to which the trio of screenwriters (Pamela Gray, Annie Mumolo, and Tim Lovestedt) and Cowperthwaite have paid attention to the details about mature relationships between humans and dogs. Dogs are pack animals and instinctively turn to a leader. This is addressed in a series of scenes where Megan is taught how to handle Rex—one trainer tells Megan her lack of confidence will be felt all the way down the leash. The physical positioning of Rex with respect to his handler (pack leader) is also consistent with animal behavior. Dogs, for example, will often present their hind quarters—one of the most vulnerable parts of a dog’s body—as a indication of submission to their “pack leader”. The film benefits from excellent performances by Mara in the title role as well as Ramon Rodriguez (The Wire, Transformers: Revenge of the Fallen, The Taking of Pelham 123) as her fellow soldier and love interest Matt Morales. Strong supporting performances by Bradley and Falco as well as Tom Felton (Harry Potter film series, Belle, Rise of the Planet of the Apes) in a smaller pivotal role as an experienced marine dog handler and mentor add polish to the film. Cowperthwaite, Gray, Mumolo and Lovestedt deserve credit for artfully refocusing a story so common it has become a trope to create a film that explores the effects of human trauma on relationships and identity in a tangible and grounded way. Many tears were flowing from men and women in the movie theater at the end of the film, and those emotions were well earned.